Terrific! Expected to be worth the money. Do not know which smoky whisky can match! 91 points. Bewitching sweetness - caramel and gummy bears - caresses the nose. In addition, aromatic, warm smoke! Suddenly vanilla comes to it. Something of intense! The smoke disappears partially completely, then comes back. Apple is now there, neatly grilled in bacon. Still extremely cute. The alcohol is already there, but tame for 57%. So complex and great can be a young smoker! I'm excited. Malt comes through now and some cowshed, I feel reminded of pastures in the Alps. Pear comes to it. The smoke is trapped in the background and accompanies all other flavors. After the first sip, the nose becomes a pure creamy caramel, to find back after some time. Again, sweet. But the smoke gets through faster and stronger. A creamy, sweetish greasy mouthfeel. It gets drier with time. The second sip has less smoke, bringing herbs that complement the sweet wonderful. Long and warm, sweet with aromatic smoked aromas. Typical Ocotmore smoke, which disappears after a few minutes and paves the way for a lush fruit basket. Cherries, blueberries, oranges, green apples, a little lemon and vanilla notes gradually crystallize out. Maritime notes, such as a slight saltiness and something mysterious mineral, refine the complex aroma, which causes more associations after 10-15 minutes and increases the anticipation of tasting immensely. Extremely oily mouthfeel, almost creamy / buttery, despite the high, well-integrated, alcohol content of 57.3%. 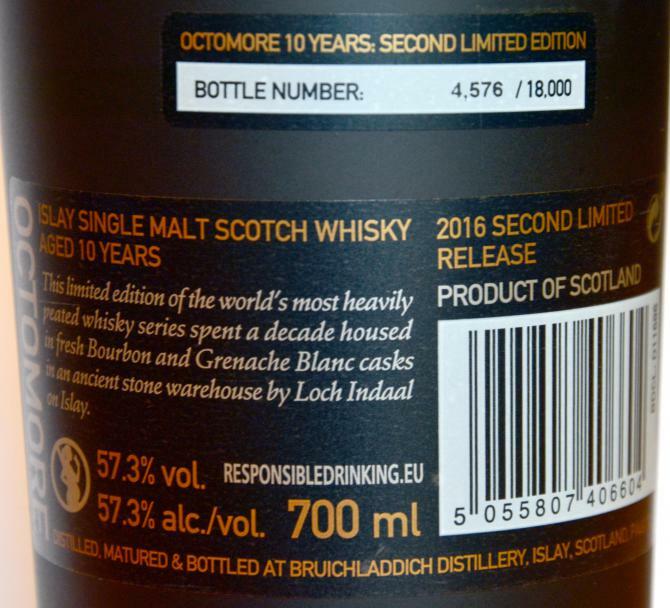 The dominant smoke sets in quickly, fruity berries, a hint of vanilla / caramel, a fine oak spiciness and the salty, mineral-maritime notes accentuate this unbelievably beautiful taste experience. Very long, the smoke passes slowly and the fruity notes gain the upper hand with a pleasant dose of oak. Strong! Roasted walnuts, orange marmalade and smoke, sweet and warm. 90/100 for my taste buds, very tasty! 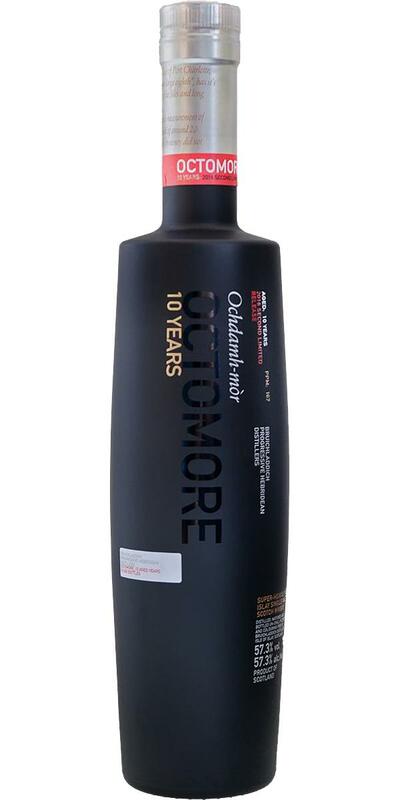 Character: Octomore-typical like a "fist in a velvet glove". Here there is full of peat smoke, but of the extremely round and soft variety. I am impressed by the variety of flavors and flavors that this bottling offers. Smoke, maritime notes, sweetness, freshness, bacon - here's a lot to fathom. And if you do not feel like it: just sit back, let the tastes come to you and enjoy the really long finish. Evaluation: Intensive Islay peat smoke of the very soft variety. For me every now and then a nice change and addition to my personal Islay favorites Lagavulin 12, Laphroaig 10 CS and Lagavulin 16th If the Octomores only priced not so athletic. Nevertheless, I enjoy 91 points. 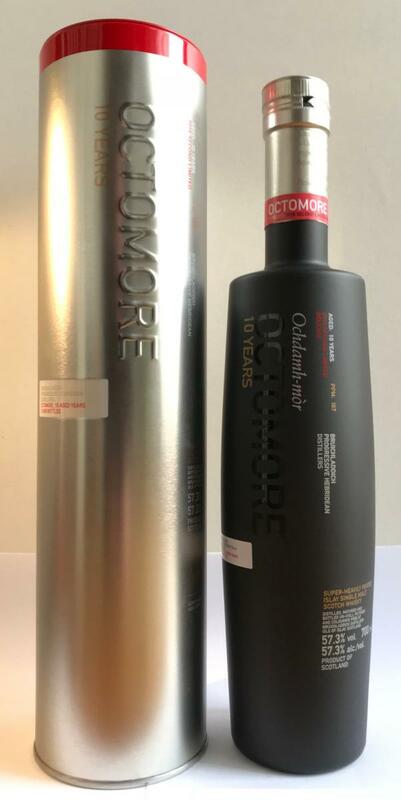 For 100 EUR the Octomore 10 would probably even be a candidate for a large bottle for me. Description: Not surprisingly, there is a lot of peat smoke in the nose right away. However, felt a bit more moderate than, for example, the 6.1. From the beginning there is a lot of smoked ham, sweet malt and delicious caramel present. Quite pronounced I also find the Heunote in this bottling. A touch of leather flashes through every now and then. The maritime is also unmistakable: here in the direction of iodine and algae. In addition to the maritime is also always a different kind of freshness present. It literally tingles a bit in the nose: like apple cider vinegar with a few lemon splashes. The alcohol is well integrated. A really nice nose, whose complexity and complexity surprised me positively. The 10 years of maturation have certainly paid off. Description: Very flattering and with a dense body, the drop meets remarkably intense on the tip of the tongue. This filling can also handle a teaspoon of water without affecting the intensity and mouthfeel. For a while, it will be pleasantly spicy and peppery in the mouth. 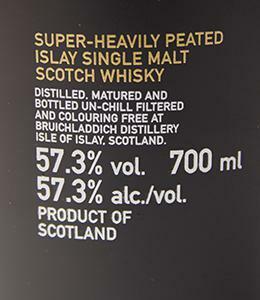 However, embedded in intense peat smoke and almost velvety acting sweet malt. In terms of taste, I find the sweetish smoked ham again - almost as if it were marinated with honey. In the transition to the finish comes a little vanilla and for a moment I even think of the creme brulee. Little by little it is becoming increasingly dry and a bit shy, a gentle oak. Description: The finish is very long and warm. Like a glow that fades away. Peat smoke, a bit of ash, dry straw and sweetish malt sound very balanced, almost gentle. In my mind's eye, I sit on a hay bale near a fading campfire and enjoy the aftertaste of the delicious bacon fried over the open fire. Oh yes: and the tasty caramel is still there profoundly. 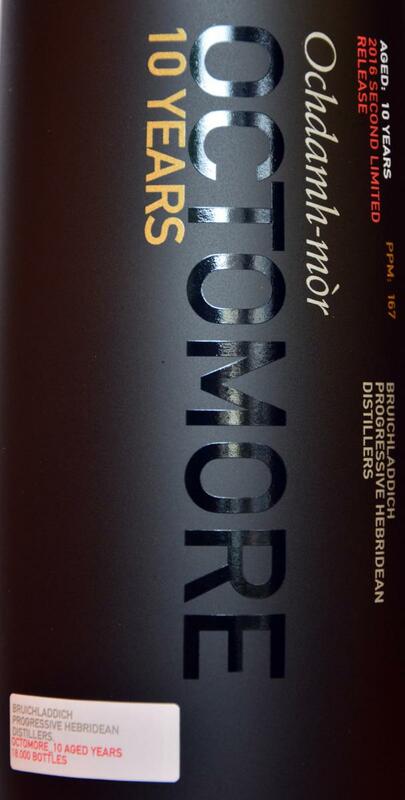 "Old" Octomore, too refined compared to other monsters, but this side is also nice for me. Peat and tar. Vanilla pudding. Herbals and spices. Mint, juniper and anise. Creamy, sweet. Grilled citruses, vanilla, ash and camphor. Spicy oak.